Elevation Change: Roughly 2000-feet of elevation gain in two separate pushes with a 400-ft descent in between. The Sunrise Trailhead is located along Tioga Road, roughly 1.4 miles east of Olmsted Point at the south end of Tenaya Lake. The small parking lot on the south side of the road is well-marked but is almost always full. Extra parking can be found along the sides of the road but look out for any "no parking here" signs. From the parking lot, follow the trail south and cross Tenaya Creek. (Rocks have been put in place to help with the stream crossing, but in spring melt conditions, you are still likely to get your feet wet.) You will pass two trail junctions very early in the hike; make sure you follow the signs to Cloud Rest and or Sunrise High Sierra Camp. As you reach the south side of the meadow, the trail begins another 1000-foot ascent and after the next junction, the trail turns west to head for the Clouds Rest ridgeline. At this elevation, most people will feel somewhat out of breath from the constant uphill; take it easy and know that you are almost there! Once the trail hits the first exposed teaser view down into Tenaya Canyon, the effort will all seem worth it. 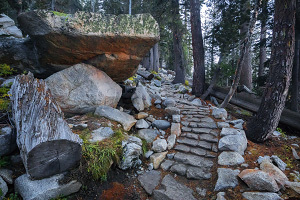 The final half-mile stretch to the summit is simply spectacular as you ascend a narrow ridgeline of granite slabs with tall drops on both sides. (While the exposure might not be considered perilous, it can definitely be intimidating to those with a fear of heights. Do not push yourself beyond your limit.) 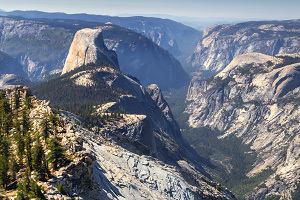 Once at the summit, you can get a wonderful 360-degree view all around Yosemite. Just south of the high point are several nice spots to relax and take in the view with the profile of Half Dome and the Subdome standing prominently in the distance. If you are lucky enough to be doing a one-way through hike, it's another 8 miles and 6000' descent to the floor of Yosemite Valley. Otherwise it's a mostly downhill return hike to Sunrise Trailhead. 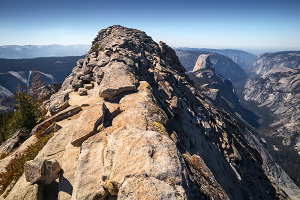 NOTE: There is an old alternate trail that wanders around the east side of Clouds Rest avoiding the actual summit, although it may be a bit washed out and hard to follow in parts. If there is any threat of thunderstorms, get off of the summit and head for lower ground. The hike from Sunrise Trailhead to Clouds Rest makes for a strenuous yet rewarding day in some classic Yosemite wilderness scenery. The elevation definitely plays a factor in difficulty and helps keep away the crowds. If you don't mind the exposure, hiking along the summit ridgeline is an absolutely stunning experience.